The ‘Mecca Railway’, the famous railway line from Damascus to Medina, built with German aid, is also a topic in the exhibition. Of special interest is the fact that the transfer to Berlin in 1903 of the largest object of Islamic art in any museum worldwide was a by-product of this railway project. The route of the ‘first Muslim railway’ passed close to the early Islamic desert castle of Mshatta. Due to the theft of stone in the past, the richly decorated façade was in acute danger of being irretrievably destroyed and used as building material. However, a request by Kaiser Wilhelm II addressed to Sultan Abdülhamid II, and the Sultan’s generous gift to his ally prevented this. 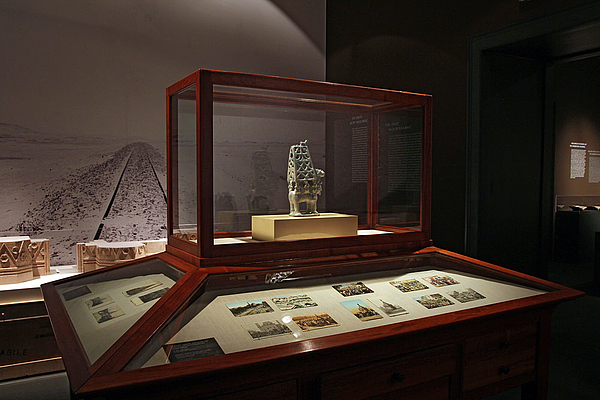 The reconstruction of the Mshatta stones in Berlin in 1904 was also the moment of inception of the Museum of Islamic Art, the organiser of the exhibition.